Check out this Rainbow Cloud Adult Size Pool Float – Over 5ft Of Inflatable Fun $24 (Retail $60). Like floating on a cloud with a brilliant rainbow overhead, this is just the summer escape you've been dreaming of! 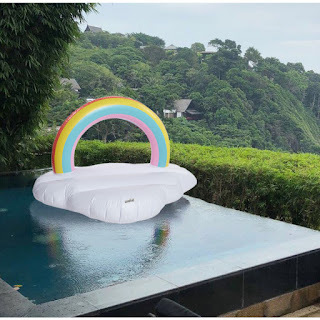 The Rainbow Pool Float by Ankit is an oversize inflatable for adults, enjoyed by teens and kids too. Just blow it up, and this poofy cloud will blow over to bring a magical rainbow to your pool party, lake, or beach day. Lay back and enjoy magical fun in the sun!